Welcome to the Bradley School of Driving! We are the premier driver education course in Eddy County. Additionally, we offer driver safety (defensive driving) courses monthly. With us, you can acquire your license at age 15 1/2, learn collision prevention strategies and defensive driving techniques, and receive DWI education. We are able to issue you the paperwork to receive an official learner's permit from the DMV when you complete our classwork and written exam; additionally, we administer the driving exam required to receive your provisional license. 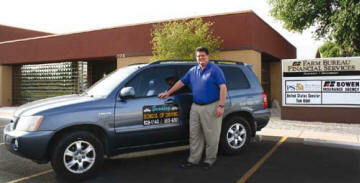 All our instructors are licensed, bonded, and insured. You may enroll at Bradley School of Driving at age fifteen and receive a referral card for an official learner's permit from the DMV upon completion of our classwork examination. Valid for six months, this permit allows you to drive with a parent, guardian, or other licensed driver over 21. The student must log at least 50 driving hours, 10 of which must be at night. After driving six months under the learner's permit in addition to successful completion of both the 50 required driving hours and our driving examination, we will issue you a Certificate of Completion. You can simply turn this in at the DMV and receive your provisional license. That means you don't have to take the test at the DMV again! The student is required to drive under the provisional license for one year, with passenger and driving time restrictions. After one year of provisional driving, and with no violations issued in the 90 days prior, you may return to the DMV and receive your unrestricted driver's license. For full requirements and restrictions, see the DMV website.